Our Cordless Express Cell Shades are made in just days so you get them fast! Each cell shade is custom built to your window sizes. Designed without lift cords for a cleaner look that is pet and child safe. The light filtering or translucent fabric allows filtered light to pass through the shades while still providing privacy. Ideal for living spaces or areas privacy is needed without blocking all the light. Note: Headrail for this product is off white in color. W: 20" 21" 22" 23" 24" 25" 26" 27" 28" 29" 30" 31" 32" 33" 34" 35" 36" 37" 38" 39" 40" 41" 42" 43" 44" 45" 46" 47" 48" 49" 50" 51" 52" 53" 54" 55" 56" 57" 58" 59" 60" 61" 62" 63" 64" 65" 66" 67" 68" 69" 70" 71" 0/0"1/8"1/4"3/8"1/2"5/8"3/4"7/8" H: 12" 13" 14" 15" 16" 17" 18" 19" 20" 21" 22" 23" 24" 25" 26" 27" 28" 29" 30" 31" 32" 33" 34" 35" 36" 37" 38" 39" 40" 41" 42" 43" 44" 45" 46" 47" 48" 49" 50" 51" 52" 53" 54" 55" 56" 57" 58" 59" 60" 61" 62" 63" 64" 65" 66" 67" 68" 69" 70" 71" 72" 73" 74" 75" 76" 77" 78" 79" 80" 81" 82" 83" 84" 0/0"1/8"1/4"3/8"1/2"5/8"3/4"7/8"
What if I have a window width of 95 inches, can I still order/use this blind? Unfortunately, this product can not be made that wide. It is too wide for a cordless mechanism. 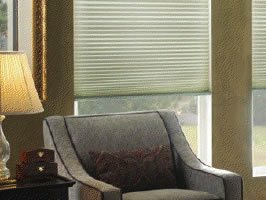 We do offer other cellular shades that can be made to that size, just without the cordless upgrade. What is the material on this blind - polyester? Is the headrail aluminum or plastic? The material for these cell shades is polyester and the head rail is vinyl. I ordered 7 blinds. I found a grey color that I liked. When I got them they were pure white!. I couldn’t return them so I am stuck with the white. It is my own fault because I didn’t ask for samples. I just wasn’t real particular what shade of grey they would be and I was in a hurry for them. I even checked the color on my, computer , iPad and phone and they all looked like it he same color. So I expected them at least to be a grey shade. Otherwise they are nice shades. I will never be happy with the color, but again, my fault. I also ordered two for a bedroom in what I thought was green. No, they are dark grey. My advise is, since they don’t take returns, make sure you get samples before ordering. We have ordered quite a few blinds from Blinds Chalet, and this one is as great as all the others. We have ordered quite a few blinds from Blinds Chalet, and this one is as great as all the others. Fits perfect, easy to install, looks perfect. Great value. Customer service is exceptional. I have placed 3 orders, and the blinds arrive promptly and in good condition. I would highly recommend this company for quality and good value.